With more people living and working in Wales past the age of 65 years, the contribution that they make to the Welsh economy is growing. So say health economists from the Centre for Health Economics and Medicines Evaluation (CHEME) at Bangor University in their report Living well for longer: The economic argument for investing in the health and wellbeing of older people in Wales launched today (30 July 2018). “In this report we explored the economic case for investing in older people as assets, through appraising the available economic evidence spanning interventions, policies and practice relevant to Wales. We aim to complement evidence produced by the National Institute for Health and Care Excellence (NICE), Social Care Institute for Excellence (SCIE), Age Alliance Wales and the Cymru Older People’s Alliance (COPA). We need to remember that after taking account of the costs of an aging population, particularly health and social care costs, older people make a net contribution of almost £6 million per day to the Welsh economy”. Wales already has a significant policy direction on investing in older people with guidelines in place to help people to prevent avoidable problems in old age by maintaining a healthy weight, eating healthily, keeping active, reducing alcohol consumption and stopping smoking. This report highlights evidence that investing in interventions such as loneliness and falls prevention programmes may save money in the long run and is in alignment with the new Welsh Government plan for a ‘Healthier Wales’. “By reducing the risk of falls, and therefore hospital attendances, the Welsh government can save money in terms of reducing spending on NHS resources in Wales and keeping older people out of residential care homes. Falls are estimated to cost the NHS in the UK more than £2 billion per year. Preventative action such as physiotherapy for older people could reduce falls in Wales by over 9 thousand a year, saving the NHS in Wales around £16 million per year”. 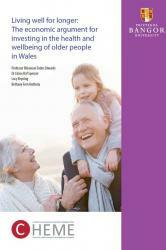 Bethany Anthony, one of the report authors said: “Older people make a significant contribution in Wales as volunteers, worth £483 million per year to the Welsh economy and expected to grow to £705 million per year by 2020. More than half of all older people (and over two thirds of older adults aged 55-64) report that they do some informal volunteering, with activities including keeping in touch with a housebound person and providing transport. One in three older people report volunteering formally with organisations and formal groups, including volunteering in children’s activities within and outside school, sports and exercise, health and social care, community groups, faith based groups and working in charity shops”. The authors concluded that enabling working for longer, facilitating volunteering and supporting working parents through care of grandchildren brings many economic returns in terms of improving wellbeing; reducing loneliness, and supporting formal and wider community services. Co-production enables older people to remain active in the community, with bi-directional, intergenerational benefits within the community and public sector services. Many older people are informal carers. There are costs of providing care to older carers who are in need of social, medical and psychological support. Carers, including carers of people with dementia, can be the key factor that can keep someone living at home or prevent admission to hospital or residential care. There is an economic case for making support for older carers a priority in Wales as there are more unpaid older carers in Wales than in any other part of the UK.